GE and Microsoft have teamed up to bring the industrial giant's Predix platform-as-a-service offering to the Azure cloud, the two companies announced Monday. It's a move that helps add to the portfolio of Internet of Things services available through Microsoft's cloud platform, at a time when the company is pushing its service for IoT applications. 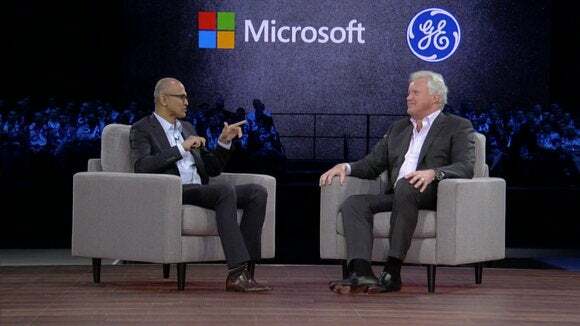 The announcement came during Microsoft's Worldwide Partner Conference in Toronto, where GE CEO Jeff Immelt talked with Microsoft CEO Satya Nadella on stage. Predix is a platform-as-a-service offering that's designed for building applications that have industrial uses. Predix services that developers can tap into include asset management and anomaly detection offerings, among others. The cloud deal is one part of a larger partnership between the two companies. Looking forward, Microsoft and GE plan to better integrate Predix into a variety of products including Azure's IoT Suite and Cortana Analytics Suite. Predix's integrations are also slated to expand to encompass productivity tools like Dynamics 365, Office 365, and Power BI. The announcement joins a number of other Microsoft partnerships in the cloud software space. The company is also working with a wide variety of other service providers including SAP and Red Hat. In addition to announcing the partnership, Immelt offered some words of wisdom for businesses currently undergoing a digital transformation like the one GE faced, especially in the industrial sector. In his view, companies need to be more aggressive about digitizing their businesses or face getting left behind as the world transforms. "My belief [is that] we're in a line of demarcation for industrial companies," Immelt said. "There's a past, and there's going to be a future. And the future is really going to be derived on who digitizes the fastest."